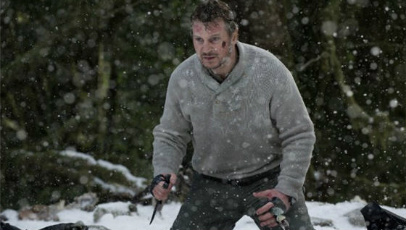 Liam Neeson is Ottway, a hunter working on an oil drilling plant in Alaska, using his rifle to protect the workers from the wolves. After his plane home crashes into the icy, barren tundra, he must find a way to band together with the five other survivors to face not only the harsh temperatures, but also an ever advancing pack of ravenous wolves. While it may be built on a sketched-out conceit offering no room for emotional resonance, but The Grey is a survival thriller that works. Carnahan’s direction builds up tension. Masanobu Takayanagi’s cinematography makes full use of the barren, snow-covered landscape, adopting sweeping camera angles and long shots as a way of highlighting the surviver’s loneliness and lack of hope for escaping the wolves’ hunger. No much can be said about the narrative, which is as basic as thrillers come. Carnahan and co-writer Ian Mackenzie Jeffers attempt to implement various set pieces and obstacles for the six men to overcome, both physically and emotionally, none of which feel necessary to the ruthless schematics of the matter at hand. It’s a film that works best when it’s as gritty as it comes, with Neeson’s Ottway barking hilarious one-liners at anyone or anything that gets on his wrong side. After a so-so modern-day reinvention into action hero (Taken and Unknown were both stinkers, and don’t even attempt to defend The A Team), Neeson finds himself as Ottway, assuming the role of leader. Aside from the hastily drawn character background, which was an entirely unnecessary way of trying to breathe substance into the narrative, Neeson is moderately successful in taking charge of the role. His co-stars also fare well. Dermot Mulroney is almost unrecognisable as Talget, while Frank Grillo develops an interesting dynamic with Neeson’s Ottway, due to their differing perspectives, opinions and personalities. The roles are easy enough to play, with any sense of backstory irrelevant, as they, one-by-one, succumb to the wolves’ ferocious attacks. The Grey was never going to be a game-changer, so kudos must be paid to all involved for noticing this early on. They laugh at themselves all along the way, whether through the juxtaposition of the existential undercurrents with lupine fistfights, or the sheer ridiculous that courses through its veins. If nothing else, it should be seen for Neeson’s cracking one-liners alone. Surprisingly good film but not a patch on Narc. Shame Carnahan has kinda gone steep downhill. Maybe this is the beginning of a reversal. Great review! The humour is something I think a lot of people missed with this film. When I saw it there were a few moments when half the cinema was laughing out loud, mainly because, just as it was for the characters, the jokes punctured moments of very high tension. I haven’t seen ‘Narc’, is it the same quality as ‘The Grey’? Narc is a lot grittier than The Grey, with much less humour. But The Grey is more in line with Narc than either Smokin’ Aces or The A Team. In regards to your humour comment, I felt exactly the same and should probably have elaborated on that a little more in my review.